Netherlands. The 1st set is very cute, but I do not know much of it. I bought it in a recycle shop in my town. Especially I like the fact that bishops at each side are male and female and that all pawns are different. The set is one of my favourites. Netherlands. The 2nd set has been made by an amateur. Large pieces in military outfits which are a bit primitively made. The pieces reside in a tailor made cabinet. There is a very nice large board that came with this set. Netherlands. In 2010 the Chess Club Nuenen did invite the "Pleincollege" in Nuenen to contribute to a presentation at the cultural centre with the title "a chess match contains a the beauty of art". The school had adopted this invitation and a randomly chosen second class (2C) made a chess set: a king-size game even though, which had to be able to be played with. The dimensions of the board are not childish: size 2*2m. The pieces are made under suspicion of Marijke Smulders, an artist, and made of wood (MDF) and styrofoam, textiles and Paverpol (textile hardener). Curtain rings, ping pong balls and skewers were used too. The most important thing is, that everyone in the class used their own creative ability to contribute. The newspapers "Rond de Linde" and the ED have published about the set. Also it has stayed two days in the monastery there and the mayor did open the manifestation "KunsT met een grote T". I got this set via a connection of the Chess Club Nuenen. They had no room to store it when they got it from the school after 2 years of display there. Netherlands. 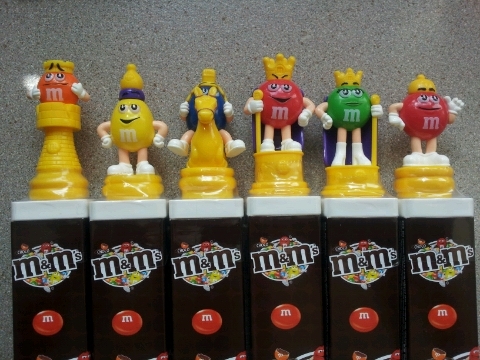 In 2012 Xenos shops in the Netherlands did have these chocolates from M&M with chess pieces for sale. Netherlands. I got the last set at my retirement. My successor, having hobbies like photography and 3d printing, did make the set on a 3D printer using photos of all of my colleagues. He made about 20 photos from all sides for each! He all did it in secret and pictures of me were taken with an excuse. He told me that it took 12 hours to print the white King, which is representing myself! This set is truly unique and one of my favourites.